﻿ Supersport CBR takes on both road going versions. Honda must inject some kind of sedative into the saddle of CBR600s which enables you to ride exceptionally fast, yet feel extremely relaxed doing it. Either that or it has got the balance of the CBR600F and CBR600F Sport spot-on. With no evidence of syringe holes in the seat, the latter explanation is probably slightly more plausible. It’s not just the road bikes that are easy to ride fast, either. If you were to jump from your stock CBR600 on to a lightweight yet very powerful Castrol Honda British Supersport bike, it would feel almost as effortless as a Labour election victory – but then you’d look at your lap times and find you’d been going much faster than you’d thought. We’ve had loads of letters asking what really separates the CBR600F Sport (the red and black one) and the standard CBR600F, apart from what’s on Honda’s spec sheets. Do they actually feel different and is it worth paying £300 more for the Sport when it doesn’t even have a centrestand? These questions and more coming up later on. No road riding stuff, just pure hard race track action on the full circuit at Cadwell Park. We’ve also got the chance to try the £25,000 Castrol Honda CBR600F Sport being raced this year by TT and North-West 200 star and current British Supersport racer John McGuinness, who’s here to lend us a hand – though it wouldn’t be fair to ask him what he thinks of the three bikes given that it’s Honda who pay his wages. In the paddock, with the mammoth Castrol Honda truck as a backdrop, it’s obvious the bikes are all from the same genetic line. The differences between the F and the Sport are subtle ones, and even though the race bike has gone the full Michael Jackson route, its origins are still apparent. The Sport looks slightly racier than the F, with a pointier rear end and SP-1-style seat unit. Its red and black paintwork and black-painted frame also look more tasteful than the yellow F we have to test. The carbon-fibre-look dash is the same on both bikes, yet the riding position on the Sport feels more radical as it tilts you more over the front end. It’s actually the seat that makes the difference. You have to look hard to find the other changes on the Sport, though, such as a one-tooth smaller rear sprocket and miniature indicators. The F comes with a centrestand, a different seat, a pillion grab handle and Dunlop D207s instead of the Bridgestone BT010s on the Sport. To even things out, we dropped the pressures on the advice of Bridgestone and the Castrol Honda team from 36psi front and 42psi rear to 33psi and 36psi respectively. That’s the road bikes, then, but what about the race bike? Whereas Honda claims the F is built to provide all the usability the CBR600 has become famous for and the Sport is more – you guessed it – sporty, the Castrol Honda bike is built to win races. And the results it has had so far this year show it’s working a treat. So far, McGuinness and team-mate Kirk McCarthy have finished fourth and first respectively at Donington, second and first at Silverstone, fourth and second at Snetterton, and sixth and second at Oulton Park. 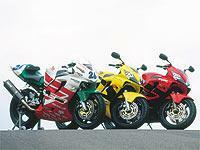 The bikes have also taken the lap records at Silverstone and Snetterton. McCarthy is currently leading the British championship and McGuinness is third overall. Quite impressive for a new bike in its first year of racing in this guise. It really is a work of art when you get to see it close-up. The bodywork has to be as light as possible so it’s made from carbon-fibre, with huge crash mushrooms – and I found out they work when the bike rolled off its paddock stand while we were taking pictures on the Mountain – and no, it was nothing to do with me. The frame and wheels are painted black like the Sport and there’s a full Micron race exhaust system with a carbon can high up for maximum ground clearance. At the front, the re-valved forks have been pulled right through the yokes and the standard calipers have new race compound brake pads and braided hoses. The brake lever is standard CBR with a span-adjuster and the clocks are also stock, with the speedo covered up so just the oil light and the temperature digital display on the tacho are showing. There are neat little quick-release clamps on the tank to let the team whip it off quickly in the event of a breakdown or crash. The electric start is still there, but the double seat has been swopped for a single unit and the whole bike is jacked up at the rear with a new shock to make it turn and handle better. There’s also a carbon chain guard. The beautifully-engineered adjustable rearsets are actually set quite low for a race bike and the clip-ons are pushed forward almost like a motocross bike. It’s bizarre, as McGuinness is a 250 rider from the past so you’d think he’d be more comfortable lying on the bike. But he reckons it works for him and has even done the same to his SP-1 road bike. And while we’re on the subject of that, did I mention how McGuinness highsided his SP-1 leaving the car park of his mate’s pub after he’d stopped for a cup of tea? We all make mistakes, of course, but most of us aren’t wearing-in our brand new Castrol leathers at the time. One bizarre thing about the race bike is the clutch lever, which has more free play than I’ve seen since my ratty old GSX250. But while that was because I was too skint to buy a new cable, McGuinness uses the free play like a slipper clutch on the way into corners to stop the rear wheel locking up under extreme downchanges and braking. Well, that’s the theory – best leave the practice to McGuinness. While they’re talking me through the bike, the team keep telling me it’s very easy to ride. I’m itching to have a go, but I’m not rushing to jump on to a Supersport bike when the Tarmac is chocker with people enjoying themselves on an MCN track day and I haven’t ridden here for some time. I don’t think I’d be very popular if a bill for £25,000 arrived at MCN and my colleagues suddenly had to face drastic cuts in the office biscuit budget. I take the softer option of the CBR600F to ease my way in and rediscover the circuit. Whatever bike you’re used to, the only thing you need to fiddle with on this is the span-adjustable brake lever. The soft padding makes your backside comfortable straight away and you instantly feel as if you’ve been riding the bike for years as the fuel injection is as smooth as a well set-up bank of carbs. The motor pulls strongly right up to 13,500rpm on the tacho, but the gearing is just a bit too tall in some places on the track. Where you want second gear, like at the bottom of the Mountain, the bike’s not in its powerband. But if you change down to first you have to shift up halfway up the Mountain. It’s a trade-off, but one you wouldn’t really notice at plenty of other tracks, most of which are flatter. The suspension is soft and friendly and does what you want, with loads of feel. The real limiting factor is the proximity of the footrests and the exhaust can to the Tarmac. They have a tendency to make the underside of your bike look like November 5 – so much so that after my first session I was pulled to one side by one of the track day officials. Official: " We’ve had a few complaints. They wanted to pull you in for wearing sparky kneesliders, but I said I’d just have a word with you once the session had ended. " Me: " I don’t wear sparky kneesliders and don’t believe in them as I know how annoying they can be when you’re following. It must have been the footrests. " Official: " We’ll put it down to aggressive riding, then. " More like the lack of ground clearance, mate. I take the CBR600FS out next and can’t believe how different it feels with just a few changes. I totally expected it to be the same bike with a different paintscheme. Wrong. The gearing makes the bike feel much more alive. Whereas the stock CBR couldn’t find the ideal revs at the bottom of the Mountain, on the Sport it’s right where you want it to be. And by the time I get on the brakes at the end of the back straight, it’s pulling 8-10mph more. Remember, the ground clearance is the same, so there’s no more corner speed, but the bike drives harder out of the corner in third gear so it’s in the sweet spot earlier. There’s a touch more induction noise on the Sport than the F we’re testing, but it’s all fairly placid sound-wise, so it’s hard to tell what the revs are. If you’re daft enough to look at your rev counter when you’re lifting the wheels off the ground over the Mountain, you probably think applying for the top job in the Tory party is a good career move. I get up to 148mph down the back straight, which isn’t exactly slow, so it’s a testament to the CBR’s brakes that they can cope with this for most of a session. It’s only in the last few laps of a 20-minute stretch that they start to fade and the lever comes back to the bars. But the shock copes well with it, though we did increase the rear pre-load on both bikes in an attempt to get a bit more ground clearance to boost corner speed. The Sport feels sharper all round than its more ordinary sibling thanks to the slightly more aggressive riding position and the fact that it changes direction slightly faster, even with the rear pre-load of both bikes set up exactly the same at one click off maximum. As I’m getting into the groove on the Sport and having shaken off a GSX-R750 that was giving me a few problems trying to keep up down the straights, I get some clear track again. I start to move my body around to give the bike more ground clearance. And then I get buzzed by McGuinness down the back straight. I thought the Sport was going fast, but he must be carrying about 10mph more than me as he blaaars past, snicks in front and bangs on the brakes before peeling into the sharp right-hander. I try to keep up, but it’s just not going to happen. He’s silky-smooth, even though he’s probably barely trying. Whereas I get too throttle-happy on the exit and overpower the rear tyre, McGuinness scythes around the sweeping bend as smoothly as a French high-speed train and is now well through the Gooseneck. Where the road bike version of what he’s riding is running out of ground clearance, the only thing up ahead that’s close to touching down is his knee. After some advice from McGuinness, it’s my turn to try his bike. Just before the tyre-warmers are slipped off, Craig Webb, who’s in charge of the Castrol CBR, tells me: " There’s nothing really that different, but make sure you’re rolling when you put it in gear or you’ll damage the gearbox meshes. " OK, here goes. My wrist band gets checked in the holding area and I sit and wait for the all-clear. There’s everything from a GSX-R1000 to a BMW R1100 GS waiting with me and I’m getting a few strange looks. Maybe because my leathers don’t match. Oh, and McGuinness is coming, too, on the Sport. I get waved out on to the track first and can feel the heat in the tyres straight away as I cruise through the Woodlands section trying to get a feel for the gearbox, the brakes and the handling. Though the gearbox has been changed back from the race shift pattern to road pattern, it’s messing with my brain. My head’s telling me I’m on a race bike so it should be upside-down. However, within a lap I’m feeling more settled and starting to notice what the bike is doing. The bars are bizarre, but they give someone of my height plenty of room to feel comfortable. McCarthy has a more conventional set-up, but though McGuinness’ bars look as if they should be shaking around as you bounce over ruts and bumps on an off-road course, they do let you brace your arms under braking and work quite well for me, too. I’m following McGuinness’ lines, but he’s already going faster than I want to on a bike worth £25,000 which needs to race at Brands this weekend. Besides, he’s raced everything known to man and is genuinely talented – which is why he’s paid to race and I’m not. I pass a few riders coming out of the corner on to the back straight and can’t believe how much drive this thing has got. Admittedly, the suspension and Dunlop D208 tyres let you get on the gas hard and early, but even so, it will easily out-drive a GSX-R750. The gearing is bang-on and after riding a road bike it’s easy to keep going for another gear because it feels like it’s revving too high. But it’s not. It’s just geared perfectly for Cadwell Park. At God knows what speed, I hit the brakes and snick down the gears. The HRC box is so light and precise it only takes a little flick of your toes to get it in the right ratio, and the brakes feel as if you could pull on them all day and they’d still feel as strong. In fact, McGuinness has been telling the team to stop bleeding them as they’re too good. I can see his point. It’s hard to believe they’re the same calipers as the ones on the road bikes. And even on the brakes the bike turns so quick I swear the marshal thought I wasn’t going to make it. But it’s no stress. Just flick it in and wind on the gas. The thing grips for what feels like for ever and around Chris Curve it holds its line, gets a little bit ruffled by the surface change and then just continues to build speed. The Gooseneck is a flick - flack and it would be too easy to get it wrong on the brakes going into the Mansfield left-hander, but the bike has better manners than a Swiss finishing school outing. Even though this is a CBR600 taken to the extreme, its user-friendly qualities are still there. But while you get many months of hassle-free riding on your road bike before it gets even a sniff of the inside of a workshop, the Castrol Honda is slightly more demanding. The team is worried about the amount of mileage on the engine before a big test it has planned, so after this the motor is going to be stripped and inspected. It’s done less than 1000 miles. The chassis is also stripped and rebuilt after every round. I’m now getting the benefit of all that care and attention. If you had this for a track day, you’d be well happy. It’s more than quick enough and handles so well you don’t need to rev it out to despatch most big road bikes. McGuinness even seemed impressed when I got both wheels off the ground a few times – well, that’s what I like to think, anyway. I may not be racing, but I can’t help getting my head down and looking through the screen as I go through Woodlands, making light work of the hairpin thanks to the brakes and the accuracy of the steering before easing on the gas and winding it up down the start straight, all much faster than the road bike could manage. I feel I’ve only just got out there, but before I know it the flag is out and I’m pulled in. I’m sweating profusely, but that’s more from adrenalin than exertion. McGuinness, on the other hand, looks like he has just stepped out of a salon. It’s bizarre how the race bike makes the road bikes seem as flat as a two-day-old glass of bubbly, yet it still feels like a CBR600. And that means it’s fast, fun, but not at all frantic. Just like the other two, in fact. for ever and around Chris Curve it holds its line, gets a little bit ruffled by the surface change and then just continues to build speed. The Gooseneck is a for ever and around Chris Curve it holds its line, gets a little bit ruffled by the surface. I’m now getting the benefit of all that care and attention. If you had this for a track day, you’d be well happy. It’s more than quick enough and handles so well you don’t need to rev it out to dispatch most big road bikes.